So I am back with yet another Popular Posts customization for blogger blogs. This one is quite special as it looks extremely elegant and has cool transition effects when hovered. 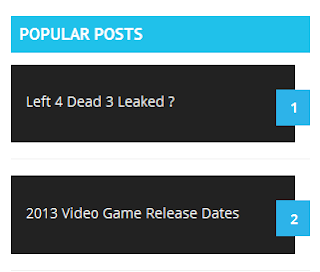 We can rarely see blogs which do not use Popular Posts widget. This widget decreases bounce rate and increase the pageviews of your blog. Making them attractive and eye-catching will make more people click on it hence making your blog more awesome and better. I have already posted Popular Posts customization tutorials many a times. You can check them out below. You can see a live working demo of this popular posts widget by clicking the button below. After seeing the demo in order to add this widget to your blog follow the steps below. Firstly go to Blog Title → Layout → Add Widget → Popular Posts. Add the widget in the desired location and save the template. After adding the code save the template. Now you and your visitors can see this awesome numbered popular posts widget in your blogger blog. Such a nice and eye catching widget. hey. your animated page load feature is cool. could you teach us how to do the same with our blog too. Thanks, your site has lot of nice widgets that other sites don't. Other sites have a lot of the same, boring widgets. A very nice plugin i had found. I was searching for it. Thanks for sharing. thanx for this grear widget. i will try it on my blog. Thanks for nice post. but the top header(skyblue clr POPULAR POST ) not apear in my Blog. Nice widget you have here !!! Pretty cool, this blog rocks! Cool widget but can you tell me how to customize it? the width the height and the position? Nice widget and look eye catching. Top!